Energy flows and personalities mingle in a setting that combines urban-influenced design, accessible technology, and a social scene that’s always abuzz. 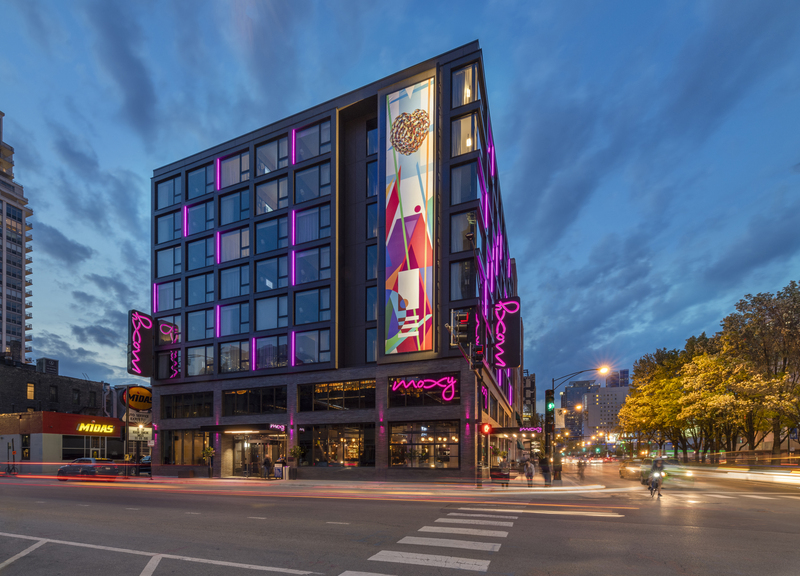 Located in the trendy River North neighborhood of downtown Chicago, Aloft Chicago City Center is close to Michigan Avenue shops, Millennium Park, Soldier Field, and award-winning restaurants. You'll find plenty to do just steps from the hotel doors. 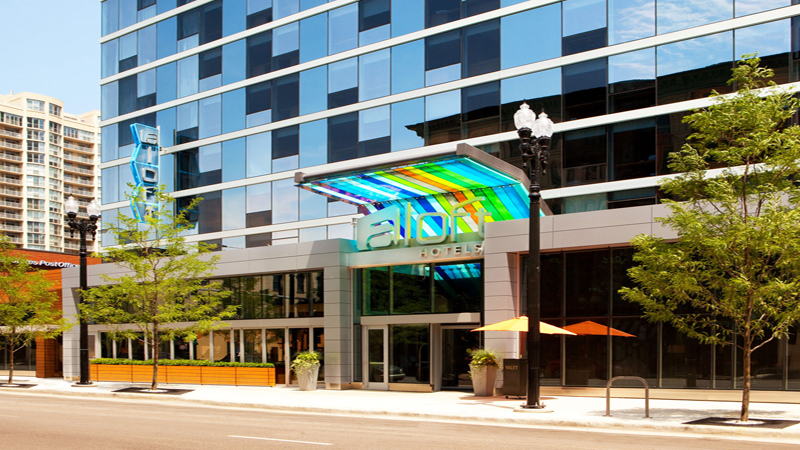 Enjoy the best weekend in Chicago with Aloft Chicago City Center. Check the best shopping, outdoor activities, museums, and cuisine. 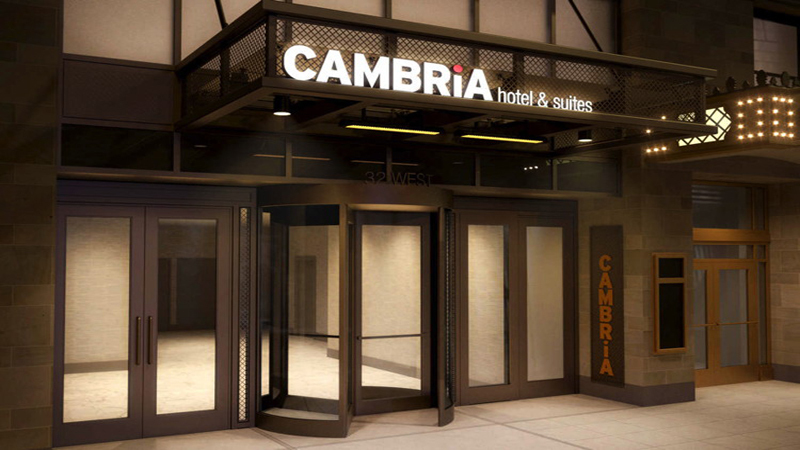 Get swept away in the excitement of the Windy City at Cambria® hotel & suites Chicago Loop - Theatre District. 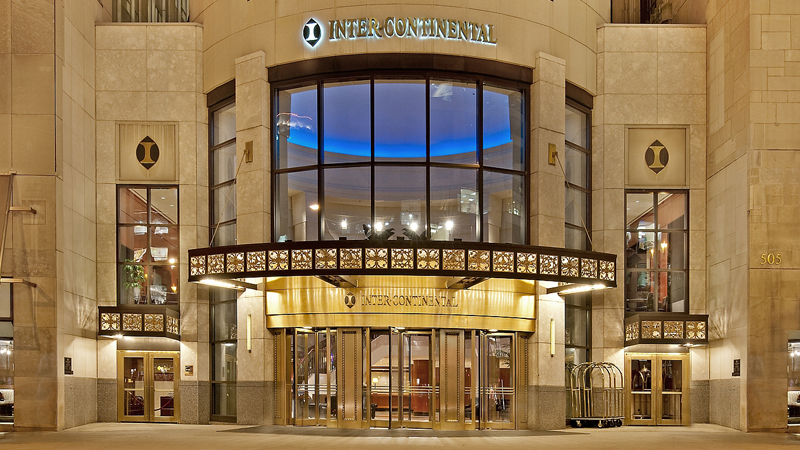 Located in the Chicago Loop, this hotel is just steps away from top attractions. The hotel's location makes it easy to take public transit just about anywhere in Chicago. Located in the same building as the Oriental Theatre at the Ford Center for the Performing Arts, and near popular attractions, including: Magnificent Mile, Water Tower Place, Field Museum, Shedd Aquarium, and Chicago Theatre District. Not your average Michigan Avenue hotel. They are your host to help you experience Chicago to its fullest. Magnificent shopping. Renowned dining. Chicago’s top attractions - Navy Pier, American Girl Place, Millennium Park, Theaters and Museums - all just a walk away from one of the leading hotels in downtown Chicago. Relax in renovated luxury Chicago hotel rooms when you’re done exploring. Explore the hotels fitness center unlike any other in Chicago. Grab a bite at Rush Street Pantry featuring Chef-crafted food focusing on fresh, gourmet options. Or, have it delivered directly to your room. 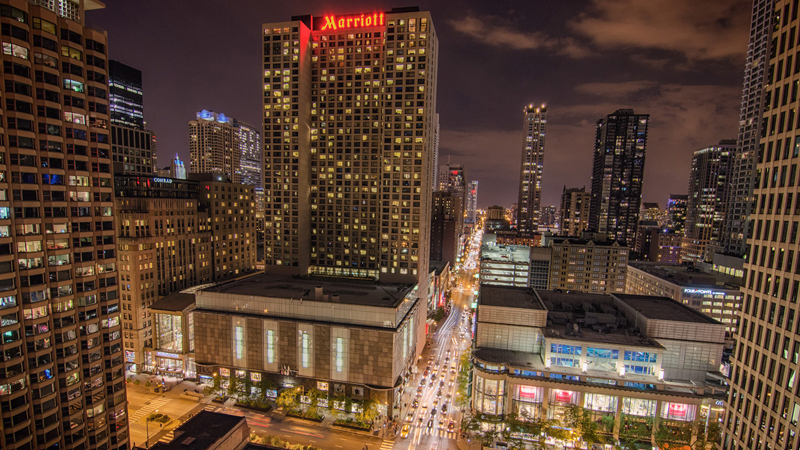 At Chicago Marriott Downtown Magnificent Mile Hotel, we want to help you travel brilliantly. Discover a haven of urban sophistication among downtown hotels in Chicago at the Courtyard Chicago Downtown/River North Hotel. Located in the trendy River North area on famed Restaurant Row, this hotel in downtown Chicago, IL offers easy access to fine dining, exciting nightlife and close proximity to the EL Train. Dine at in-house restaurant Davanti Enoteca to taste authentic, rustic Italian, or grab a gourmet doughnut and coffee at Glazed & Infused. Experience the Windy City from the modern comforts of oversized downtown Chicago, IL hotel rooms offering plush bedding and amenities. For those looking to stay fit on the road, the fitness center with indoor pool sets this hotel in downtown Chicago, Illinois apart from the rest. Plan accordingly with technologically adept meeting space, ideal for corporate gatherings or intimate social functions. Depart from typical downtown Chicago, IL hotels and take advantage of the revitalized Courtyard Downtown/River North Hotel located in the heart of Chicago. 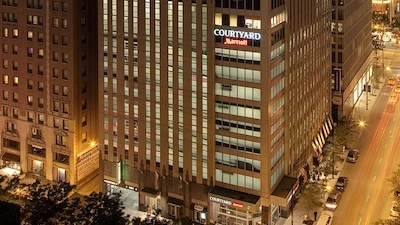 The Courtyard Marriott Chicago Downtown/Magnificent Mile features a stylish lobby with a Starbucks coffee shop and plenty of comfortable seating to watch the bustling activity of the famous Mag Mile. Our Downtown Chicago hotel is ideally located just minutes from the Loop business district, Navy Pier, McCormick Place and premium Michigan Avenue shopping including Macys, Tiffany & Co., Nordstroms, Neiman Marcus, Water Tower Place, and more. Our experienced concierge and interactive GoBoard will keep you up to speed on the latest news, traffic and downtown Chicago happenings. Pamper yourself with an indoor pool & fitness facility and upscale restaurant as well as over 3,700 sq ft of meeting space including nine meeting rooms and on-site catering. Stay connected with free WiFi in your guestroom and throughout the lobby. 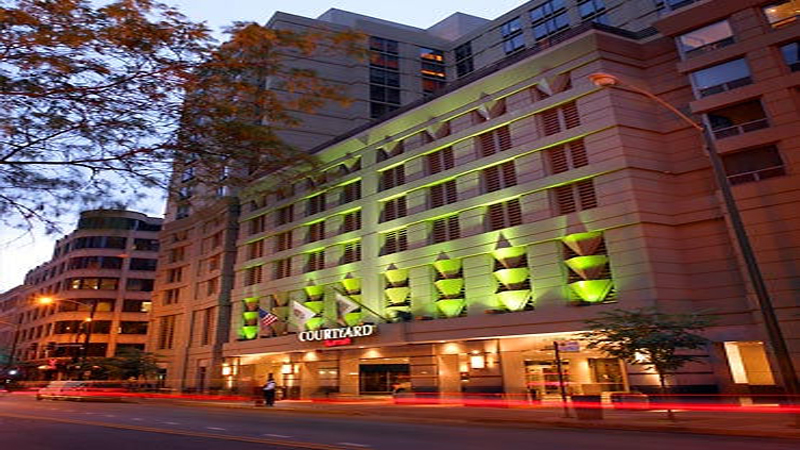 Offering an upscale, full-service feel, at the value of a Courtyard, Courtyard Marriott Chicago Downtown/Magnificent Mile is a leader among hotels in Downtown Chicago. 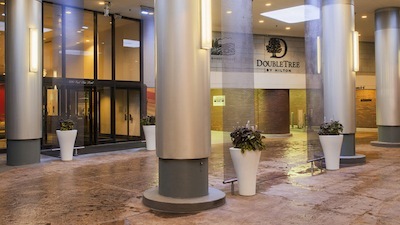 Located two blocks from Michigan Avenue and the famous Magnificent Mile, Doubletree by Hilton Hotel Chicago - Magnificent Mile puts you in easy reach of some of the city's best shopping, dining and entertainment. Less than 45 minutes from Chicago O'Hare and Midway Airports, Doubletree by Hilton Chicago - Magnificent Mile lets you make the most of your time in the city. 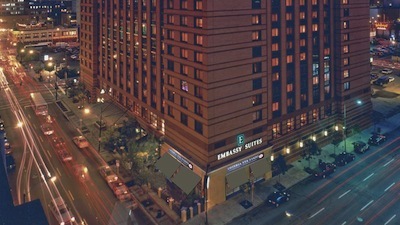 At Embassy Suites by Hilton Chicago Downtown, you are in the heart of downtown Chicago, Illinois, surrounded by shopping and entertainment venues. Located on State Street between Ohio and Ontario Streets, were three blocks west of Michigan Avenues Magnificent Mile, and convenient to the Loop, the financial district and popular attractions. A block away is the free seasonal Navy Pier trolley and subway, linking to local attractions and both Midway and O'Hare airports. A great choice in Chicago. 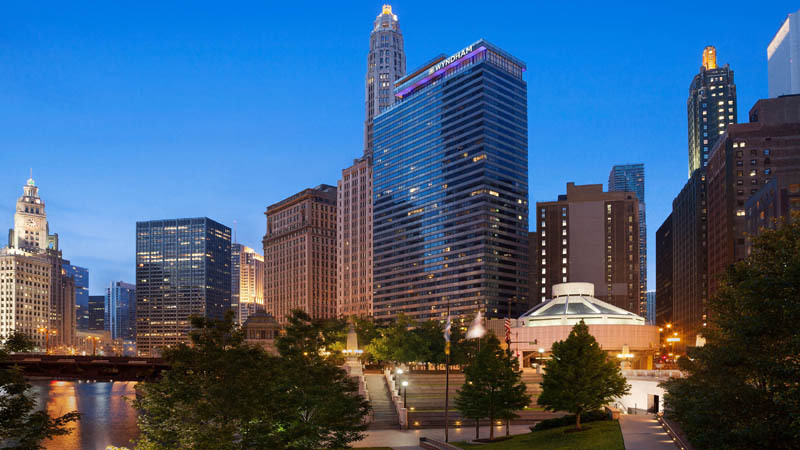 With spectacular views of the downtown area, Embassy Suites Chicago Downtown Magnificent Mile provides you not only with upscale sophistication but more space to unwind and be yourself. That is why they have 455 spacious suites featuring private bedrooms and separate living areas, outfitted with 37-inch TVs, in addition to kitchenettes with refrigerators, microwaves and coffeemakers. There is a bright and spacious open-air atrium featuring a 75 ft. eco wall with the soft sounds of rippling water. It’s perfect for coming together at the free made-to-order breakfast or grabbing a drink and some snacks at their complimentary Evening Reception*. After an exciting day of discovering Chicago, unwind in the heated indoor pool, relax in the sauna and rejuvenate in the well-equipped fitness center. 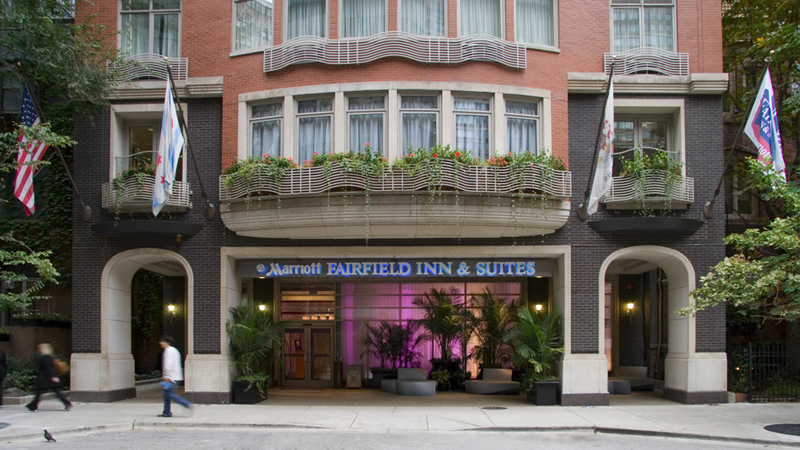 A one-of-a-kind hotel experience awaits you here at the Fairfield Inn & Suites Chicago Downtown/Magnificent Mile. 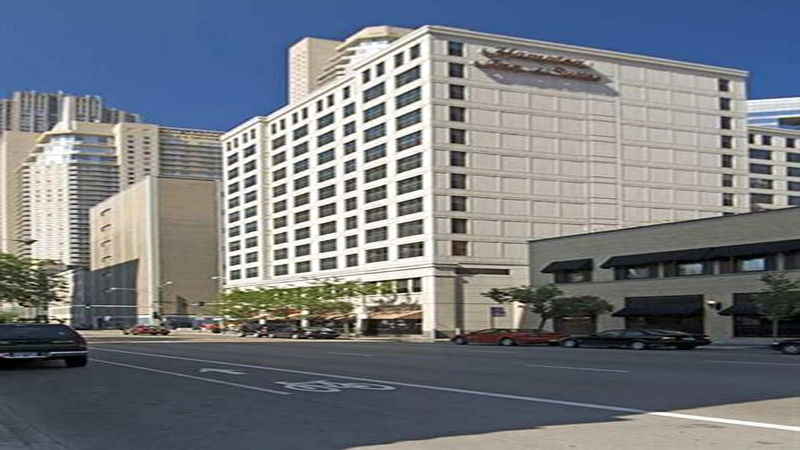 Intuitively designed and ideally situated in the heart of the city, this hotel is less than two blocks away from Chicago’s famed Magnificent Mile, and a short distance from popular attractions including Shedd Aquarium, Millennium Park and the Navy Pier. The stylish, modern accommodations are designed with your comfort and convenience in mind, and include plush beds, flat-screen TVs and free Wi-Fi. Start your day here in downtown Chicago with the delicious free breakfast or enjoy a workout in the hotel fitness center. 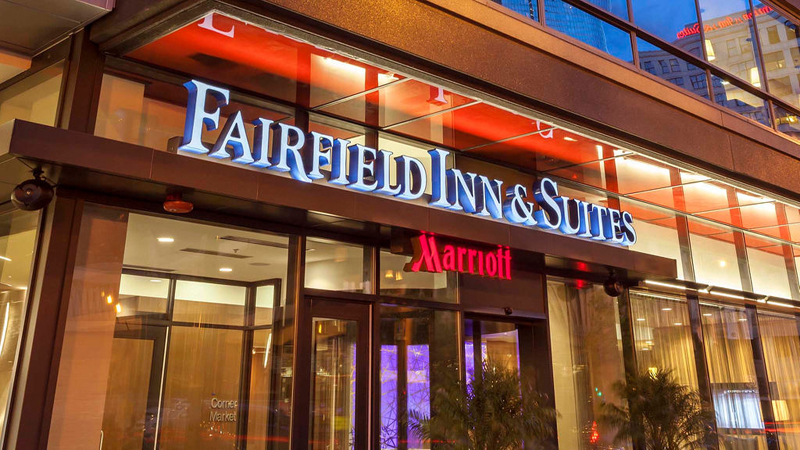 At the Fairfield Inn & Suites Chicago Downtown/Magnificent Mile, you’re their #1 priority. Fairfield Inn Chicago Downtown/River North stands 19 floors tall in the creativity and entertainment hub of Chicago's newest district. This central location in the heart of Downtown not only offers incomparable views but easy access to Navy Pier, Magnificent Mile and Millennium Park. Adjacent to the hotel is Beatrix, a top choice among River North restaurants with unique dishes and specialty cocktails. Along with free Wi-Fi and complimentary daily breakfast, expect cozy rooms and high-level suites with pillow-top mattresses and down comforters for a restful night's sleep in the Windy City. Work out at your leisure in the well-equipped fitness center with cardio equipment and free weights. Same-day dry cleaning and ergonomic work spaces boost productivity for business guests, and vacationers can appreciate free HBO on 40-inch TVs. The comfort and convenience of Fairfield Inn Chicago Downtown/River North will surely blow you away. A stellar location, a huge spa and an award-winning restaurant and wine bar get high marks from Hotel guests at the luxe Fairmont Chicago. 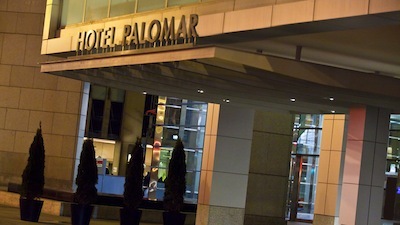 This 45-story Fairmont Chicago has 687 rooms furnished with plush beds and spacious bathrooms; hypoallergenic accommodations are also available. Rooms sport 42-inch flat-panel TVs with on-demand movies and iPod docking stations, and complimentary Wi-Fi. Enjoy a curated menu of signature cocktails and word-class wines by the glass paired with contemporary small plates in THE BAR. Find urban sanctuary in the 11,000-square-foot spa, featuring eight treatment rooms and a fitness studio. 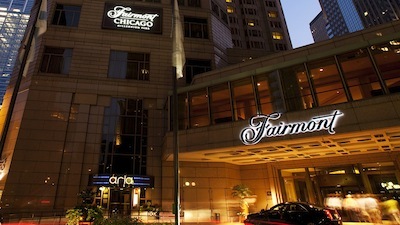 Located one block north of Millennium Park and Grant Park, the Fairmont is 18 miles southeast of O’Hare International Airport and 12 miles northeast of Midway. The Chicago L provides service from both airports into the downtown area. 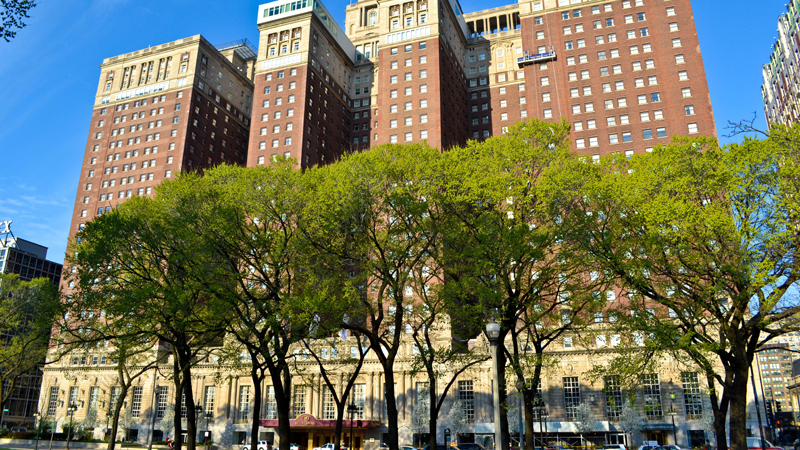 With Grant Park and its attractions close at hand, there is plenty to see and do surrounding the Fairmont. The Art Institute, the country’s second-largest art museum, is just a 12-minute walk south. Spa-induced relaxation, a spectacular lobby, beautiful rooms and a perch that is walking distance to key attractions have Hotel guests raving about the Fairmont Chicago. 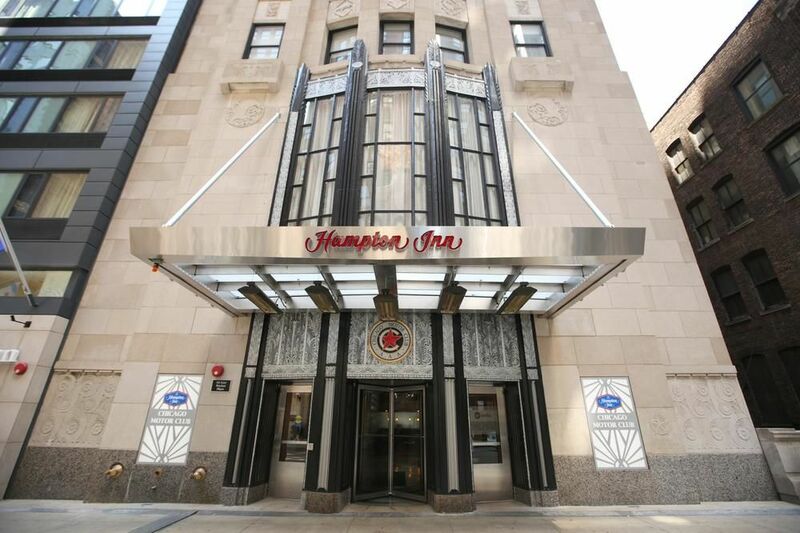 Experience Chicago from Hampton Inn & Suites Chicago-Downtown, located steps from the Magnificent Mile in Chicago, Illinois. This vibrant River North location is surrounded by shops and restaurants. Walk from the hotel to businesses, attractions and the Chicago Transit Authority’s Grand Red Line stop. As the only Chicago Downtown Hampton with a year-round indoor swimming pool, they also offer great amenities such as free Wi-Fi, free hot breakfast and on-site fitness center. Enjoy Hampton's free hot breakfast while admiring city views from the second floor of this downtown Chicago hotel. Reserve a table at nearby Ruth's Chris Steakhouse or visit their on-site Rosebud Restaurant, Joe Fish, to savor contemporary American fare influenced by the regional food traditions of Italy. Hampton Inn Chicago Downtown/N Loop/Michigan Ave is situated on East Wacker Place, just south of the Chicago River and slightly west of Lake Michigan. Millennium Park is two blocks away and there are lots of attractions close to this Chicago Loop hotel. Visit one of Lake Michigan’s beaches, browse the upscale shops and boutiques on the Magnificent Mile, or discover the iconic architecture and contemporary art of Millennium Park. Enjoy shopping, dining, museums, entertainment and seasonal events at Navy Pier. Start your day with Hampton’s free hot breakfast buffet, or grab a free Hampton’s On the Run Breakfast Bag™, Monday – Friday. Settle into a comfortable guest room at this Chicago Loop hotel. Sip a cup of coffee as you check emails with free WiFi. Work comfortably at the ergonomic desk or use the handy lap desk. Relax on the clean and fresh Hampton bed® and watch the 42-inch flat-screen HDTV. Maintaining your exercise routine is easy at this welcoming hotel in the Chicago Loop; work out with contemporary cardio equipment in the free 24-hour fitness center. The 24-hour Suite Shop stocks all the snacks, drinks and sundries you’ll need. Enjoy your favorite drink in the inviting Jack's Place bar, situated in the hotel lobby. Take advantage of professional services in the 24-hour business center. This new hotel in McCormick Square forms part of Hilton's first tri-branded hotel, featuring Hampton Inn, Hilton Garden Inn and Home2 Suites. Kick back in your contemporary Hampton Inn hotel room, featuring all of the great amenities including free WiFi access, an HDTV, coffeemaker and our clean and fresh Hampton bed®. Each morning you'll wake up to fresh waffles and oatmeal at Hampton's free hot breakfast and you can enjoy free coffee and tea in the lobby 24 hours a day. Catch up with work in the business center or maintain your exercise routine in the fitness center and indoor pool. This prime location in McCormick Square features an indoor skybridge connecting to McCormick Place. They are also adjacent to the all-new Wintrust Arena and offer easy access to Chicago's major airports and main attractions. Perfectly situated just steps off the Magnificent Mile and boasting wonderful views of Lake Michigan and Michigan Avenue, Hampton Inn Chicago Downtown/Magnificent Mile is just across the street from Northwestern Memorial Hospital, Lurie Children’s Hospital and the Rehabilitation Institute of Chicago. Discover lots of shops and popular restaurants nearby and visit museums and popular attractions that are easily reached from this Chicago Magnificent Mile hotel. Feel at home in a comfortable and spacious guest room, equipped with free WiFi, a 37-inch flat-screen HDTV and a clean and fresh Hampton bed. Each morning of your stay, wake up to fresh waffles and hearty, topped oatmeal at Hamptons free hot breakfast. If you’re heading out early, grab a Hamptons On the Run Breakfast bag Monday through Friday. Buy snacks, drinks and toiletries in the on-site Suite Shop and enjoy free tea and coffee 24 hours a day in the welcoming lobby. Take advantage of good weather in the seasonal outdoor pool, which is located on the 40th floor and offers views of Michigan Avenue and Lake Michigan. Energize with the latest exercise equipment in our Chicago Magnificent Mile hotels free fitness center. Sinkably soft beds, on-site parking, and a huge health and wellness center area among the perks that Hotel guests enjoy at the historic Hilton Chicago. Built in 1927, this hotel - the third-largest in Chicago - has 1,544 rooms on 29 floors. Sleep serenely on the plush-top mattress with down pillow and down comforter. In-room Wi-Fi and wired internet are both available complimentary. There’s a breakfast buffet available for an additional cost, as well as a steak and seafood restaurant and an Irish pub. On-site parking is available for a fee. A full-service business center and an 18,000-square-foot health and fitness center with an indoor pool and running track round out the major amenities. From this highly central hotel, Grant Park is just a 10-minute walk away, and Shedd Aquarium and Field Museum are both a mile away. Hotel guests praise this historic Hilton Chicago’s appealing decor, comfortable beds and fantastic location that’s across from parks, museums, and Lake Michigan. 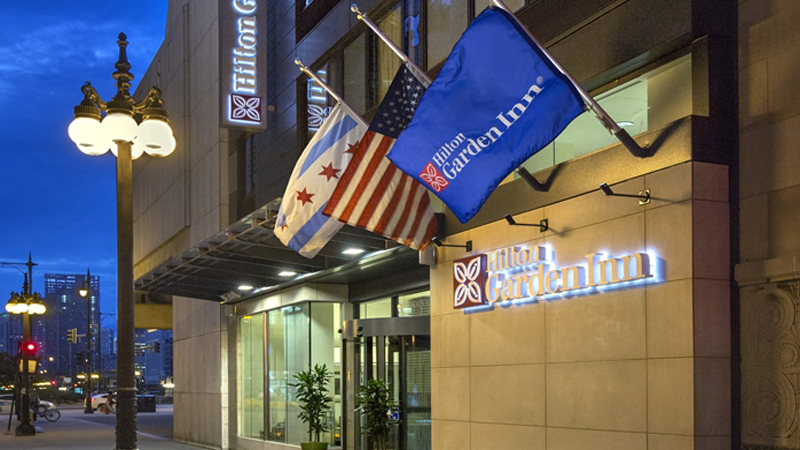 Relax in comfort at the Hilton Garden Inn Chicago Downtown/Magnificent Mile hotel, just steps from North Michigan Avenue shopping and River North attractions. This hotel is conveniently located close to Navy Pier, Merchandise Mart, and Chicago’s business loop and theater district. Chicago’s public train, the L, is located outside the front door for easy access to Soldier Field, Wrigley Field, US Cellular Field, Museum Campus and both Chicago airports. Enjoy hotel dining with classic outdoor grilling at Weber Grill, their casual on-site restaurant. Convenient amenities include complimentary WiFi in all guest rooms and 24-hour business center. Stay fit in the sparkling indoor heated pool and relax in the whirlpool located next to our fitness center. Hilton Garden Inn Chicago McCormick Place is ideally located in McCormick Square, this contemporary hotel forms part of Hilton’s first ever tri-branded hotel, featuring Hilton Garden Inn, Hampton Inn and Home2 Suites.The hotel offers an unbeatable location, connected to McCormick Place via an indoor skybridge and adjacent to the all-new Wintrust Arena. They are also just two blocks from the Green Line ‘L’ Stop, providing easy access to Chicago’s attractions including Millennium Park, Navy Pier, and Soldier Field. Kick back and relax in your comfortable guest room or suite at Hilton Garden Inn. Each of their modern rooms feature 55-inch HDTV’s, complimentary WiFi, a work area, and homelike amenities including a microwave, mini-fridge and Keurig® coffee/tea maker. Other great amenities in the hotel include a 24-hour business center, Pavilion Pantry®, fitness center and an indoor pool. 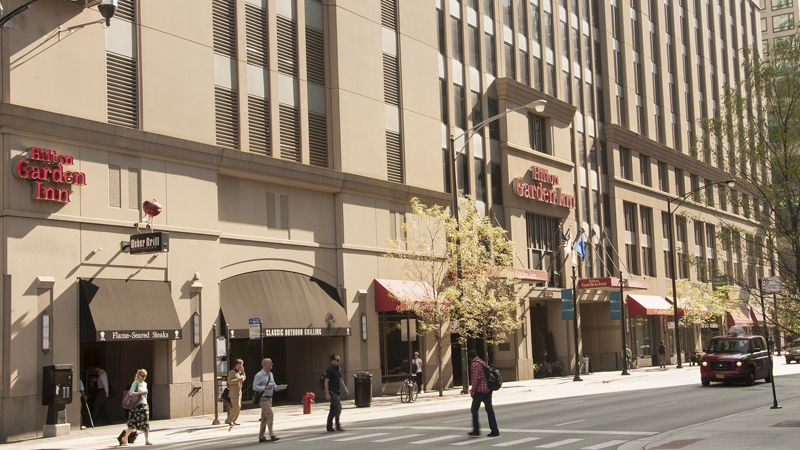 Hilton Garden Inn Chicago/North Loop hotel is located on the north side of Chicago’s business loop, close to many businesses and corporations, and offers easy access to both Chicago airports. This downtown hotel is set near River North, just blocks away from the Magnificent Mile with its upscale shops and boutiques. Have a picnic in the nearby Millennium Park, enjoy museums and seasonal events at Navy Pier, or visit one of Lake Michigan beaches. 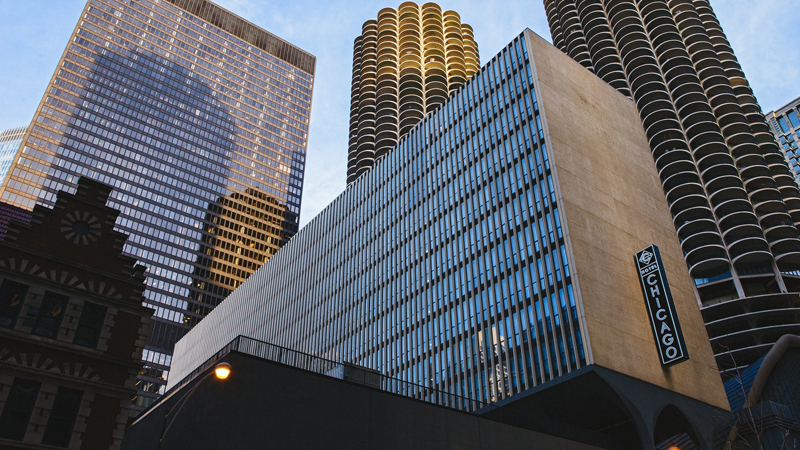 Theatre enthusiasts will enjoy the hotels proximity to Chicago’s bustling theatre district. Their full-service restaurant, The Garden Grille & Bar, serves cooked-to-order breakfast as well as daily specials for dinner. In the evening, pop in for a relaxing after-work cocktail, work off some calories in the 24-hour fitness center, or simply unwind in your room and order room service. Unbeatable location in the South Loop at McCormick Square. This modern hotel forms part of Hilton’s first tri-branded hotel, featuring Hampton Inn, Hilton Garden Inn and Home2 Suites. Along with a skybridge to the McCormick Place convention center, their hotel is steps from Wintrust Arena and two blocks from the Green Line, with easy access to Chicago attractions, like Millennium Park, Navy Pier and Soldier Field. Midway and O’Hare airports are both 30 min away. Suites are vibrant spaces with home comforts like free WiFi, a 55-inch HDTV, premium cable, a sofa bed, and a ‘working wall’ with storage areas, a rolling desk and Humanscale® ergonomic chair. The in-suite kitchen offers a sink, full-size refrigerator/freezer, dishwasher, microwave, coffeemaker, dishes and utensils. They have free breakfast with all your favorites, and don’t miss the rooftop lounge – open to all guests of this tri-build hotel – offering small plates, inventive drinks and sweeping views of Lake Michigan and the city. Their Home2 hotel also features an indoor pool, a unique Spin2 Cycle fitness/laundry area, and an Oasis lounge with business services and 24-hour Coffee2 Tea. Immerse yourself in the energy and style of one of the world’s most exciting cities. The newly renovated Hotel Chicago Downtown, Autograph Collection will delight the most discerning traveler, with its picture-perfect location and luxury accommodations. Boutique hotel rooms and suites offer sumptuous decor, deluxe pillowtop bedding, and marble bathrooms filled with premium products, as well as a fully-stocked mini-bar and a flat-screen TV. Additional perks for your hotel visit include valet parking and a well-equipped 24-hour fitness center, as well as a staffed on-site business center. And of course, with easy access to downtown attractions including Navy Pier, the Lincoln Park Zoo, the Chicago Theater and Wrigley Field, you’ll find plenty to keep you busy during your visit. They eagerly await your arrival at the Hotel Chicago Downtown, Autograph Collection. From the windows of your newly refreshed guestroom or suite, you’ll catch the kind of glimpses of Chicago that star in movies. 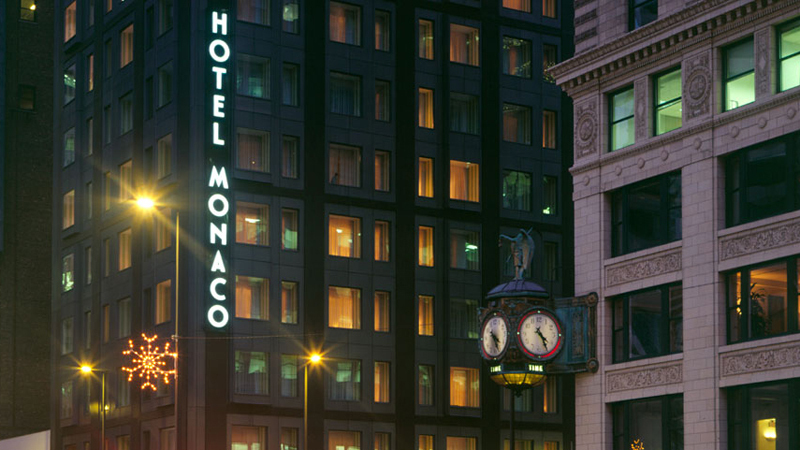 Overlooking the Chicago River, the AAA Four Diamond Hotel Monaco is right in the downtown Loop, near Millennium Park and Michigan Avenue. That puts you in the heart of iconic Chicago for exploring the city’s famous attractions. When you return from being out and about, you’ll be greeted with a style-savvy, inviting lobby and an upscale room ripe for relaxing. Set in the heart of the Magnificent Mile, the Hyatt Chicago Magnificent Mile boasts an indoor pool, a fitness center and free Wi-Fi. The 17-floor Hyatt’s 417 rooms feature pillowtop beds, snow-white cotton linens and enormous windows overlooking either the Chicago Skyline or Lake Michigan. Large baths have granite counters and luxury spa products, and there’s plenty of room to work, if you must, with ample in-room workspaces that sport Herman Miller chairs and free Wi-Fi. There’s also a staffed business center on-site. The on-site restaurant, open for breakfast, lunch and dinner, serves cuisine with a local flair as well as sushi. As for leisure amenities, you’ll find a large, well-equipped fitness center with a sauna and steam room on the premises. The Hyatt is three blocks from the lively Lake Michigan waterfront - popular with joggers, walkers and fishermen. It is within walking distance of Willis Tower (formerly known as Sears Tower), the Time-Life Building, the John Hancock Center, and some of downtown Chicago’s finest restaurants. 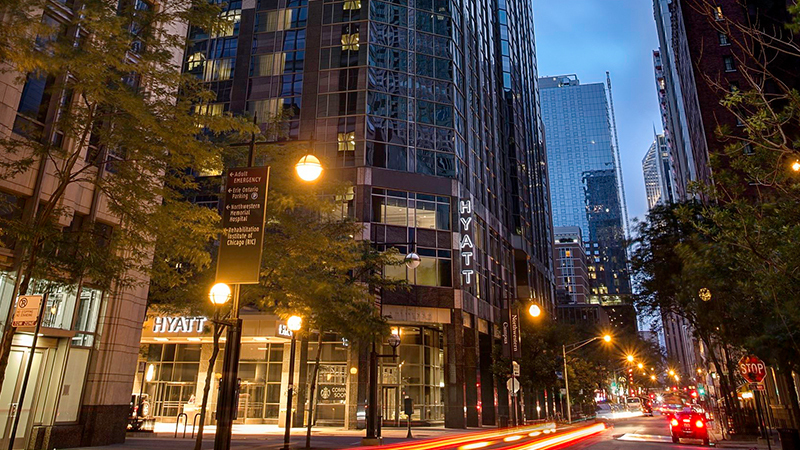 An outstanding downtown location that works for business and leisure, along with beautiful rooms and a very courteous staff are highlights at the Hyatt Chicago Magnificent Mile, say Hotel guests. 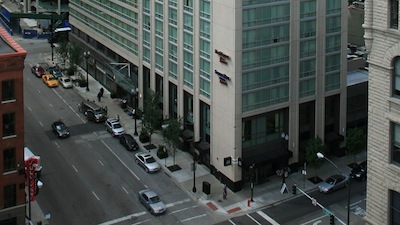 This hotel is close to John Hancock Center and Millennium Park. 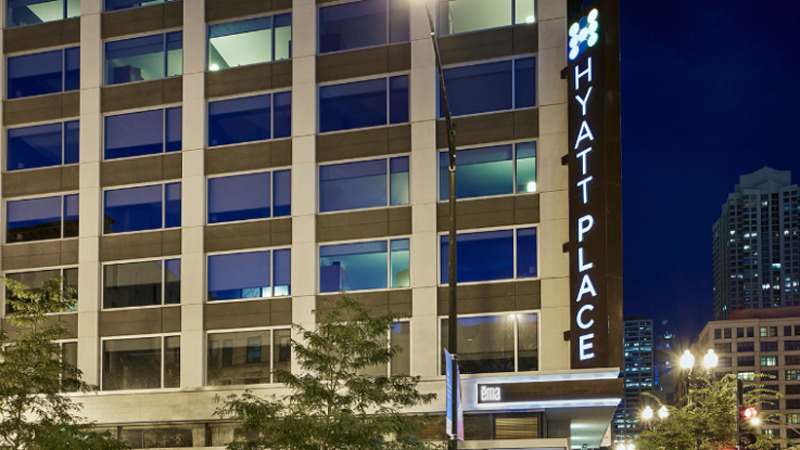 A stay at Hyatt Place Chicago/River North places you in the heart of Chicago, walking distance from House of Blues Chicago and Vietnam Veterans Memorial. Make yourself at home in one of the 212 air-conditioned rooms featuring refrigerators and flat-screen televisions. Wired and wireless Internet access is complimentary, while MP3 docking stations and cable programming provide entertainment. Bathrooms have designer toiletries and hair dryers. Conveniences include phones, as well as desks and complimentary newspapers. Amenities Take advantage of recreation opportunities such as a 24-hour fitness center, or other amenities including complimentary wireless Internet access and tour/ticket assistance. Grab a bite to eat at the hotel's restaurant, which features a bar, or stay in and take advantage of room service (during limited hours). Quench your thirst with your favorite drink at a bar/lounge. Featured amenities include complimentary wired Internet access, a 24-hour business center, and complimentary newspapers in the lobby. A great location near Chicago’s Magnificent Mile sets the scene for four impressive restaurants, two lounges and plush rooms at the Hyatt Regency Chicago. 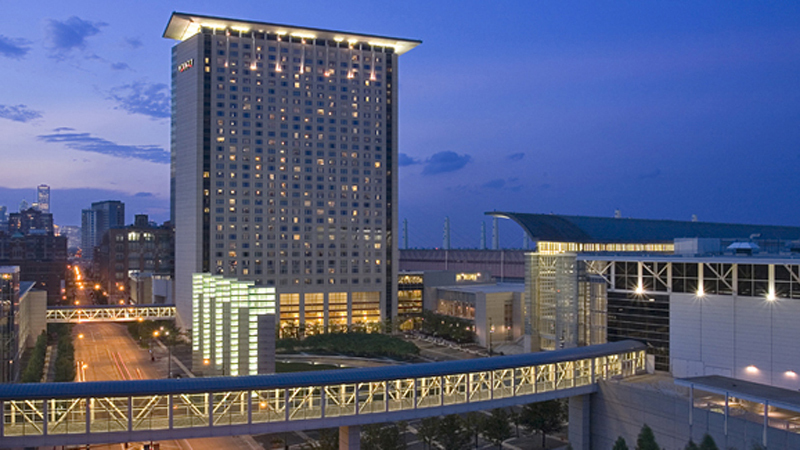 The high-rise Hyatt Regency has 2,019 rooms that all feature pillowtop mattresses, luxurious linens and down blankets. Hypoallergenic rooms are available. Rooms also include iHome stereo and iPod docking stations and 37-inch flat-panel TVs. The four on-site restaurants include a steak house, a bistro (which also serves a breakfast buffet each morning), an Irish pub and an Italian eatery. Two lounges, a full-service business center and a 24-hour fitness room round out the offerings. The Hyatt Regency is in the thick of high-end shopping; the Magnificent Mile is a five-minute walk away. Ride the 150-foot Ferris Wheel or visit the Chicago Children’s Museum at Navy Pier, a six-minute cab ride east. 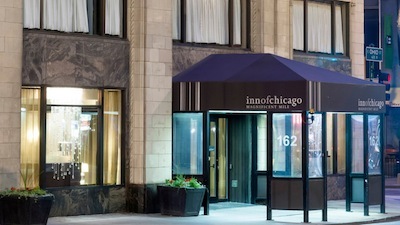 The hotel is a 10-minute walk from the Chicago Theater; the Art Institute of Chicago and Navy Pier are one mile away. Hotel guests praise this great hotel in a location close to everything for its professional and accommodating staff, gorgeous lobby and views of the Chicago River and Lake Michigan. Plush pillowtop mattresses, an indoor pool and a handy location at the convention center make the non-smoking Hyatt Regency McCormick Place a fine choice for Hotel guests. The 33-story Hyatt Regency McCormick Place has 1,259 rooms wired for the modern traveler with free Wi-Fi and technology Jack Packs featuring additional electronic outlets, HDMI, iPod/iPhone, VGA, USB, video/audio and RCA connections. Sleep in grand style on pillowtop mattresses and cushy cotton sheets. Rooms also feature 42-inch HDTVs, mini-fridges and safes. A sun deck, a 24-hour gym and an indoor pool and sauna are among the hotels leisure-time options. There is also an on-site Italian restaurant and a steak-and-seafood eatery, plus a business center. The Hyatt is attached via two sky bridges to McCormick Place, the largest convention center in the country. The Loop, the Art Institute and other downtown sights are under three miles away, and Soldier Field is about one mile. This boutique hotel's location situated in the heart of downtown Chicago is just half a block from the Magnificent Mile and numerous other Chicago attractions. When you're ready to rest, you'll love that the hotel's guest rooms and suites offer comfortable and stylish downtown Chicago accommodations designed with your comfort and needs in mind. Experience modern comfort with a touch of 1920’s splendor. This lovingly restored Chicago luxury hotel was once the 1929 Madinah Athletics Club. 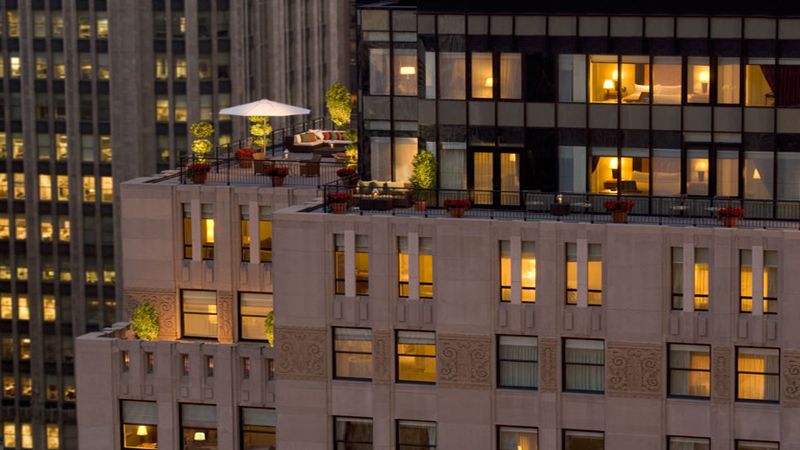 Part of Michigan Avenue’s architectural elite, luxury details include ENO for wine tasting, recreated gold leaf murals and an ornate pool once used by Tarzan actor Johnny Weissmuller. Discover the best of Chicago within walking distance of museums, upscale shopping and theatres. Navy Pier, Shedd Aquarium and Oak Street Beach are minutes away. 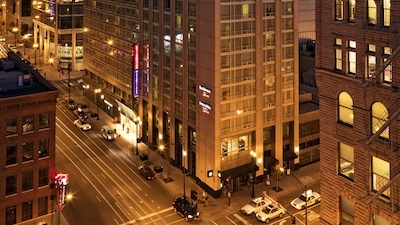 Loews Chicago Hotel is in the heart of Chicago, walking distance from Tribune Tower and Wrigley Building. This 4.5-star hotel is close to Millennium Park and John Hancock Center. Make yourself at home in one of the 400 air-conditioned rooms featuring iPod docking stations and minibars. 42-inch flat-screen televisions with pay movies provide entertainment, while complimentary wireless Internet access keeps you connected. Private bathrooms have designer toiletries and hair dryers. Conveniences include phones, as well as laptop-compatible safes and desks. Amenities Relax at the full-service spa, where you can enjoy massages, body treatments, and facials. If you're looking for recreational opportunities, you'll find an indoor pool and a 24-hour fitness center. This hotel also features complimentary wireless Internet access, concierge services, and babysitting/childcare (surcharge). Enjoy a meal at a restaurant or in a coffee shop/café. Or stay in and take advantage of the hotel's 24-hour room service. Relax with your favorite drink at a bar/lounge or a poolside bar. Featured amenities include a 24-hour business center, express check-out, and complimentary newspapers in the lobby. Bold. Inspiring. Connected. Chicago's legendary skyline is about to become even more breathtaking. Marriott Marquis soars 40 stories over the city's lakefront and South Loop. 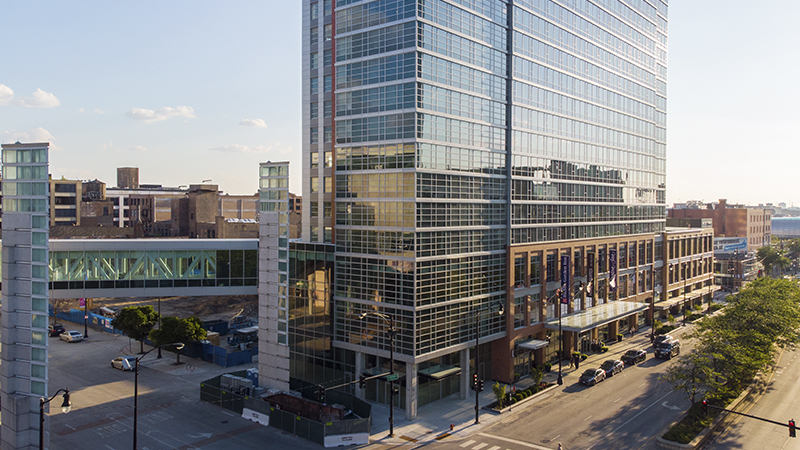 Directly connected to McCormick Place, the Marriott Marquis provides a nearly infinite combination of flexible event spaces. Located near the lakefront and two blocks from the Green Line ‘L' stop, guests can experience Chicago's many attractions; such as Millennium Park, Navy Pier, and Soldier Field. 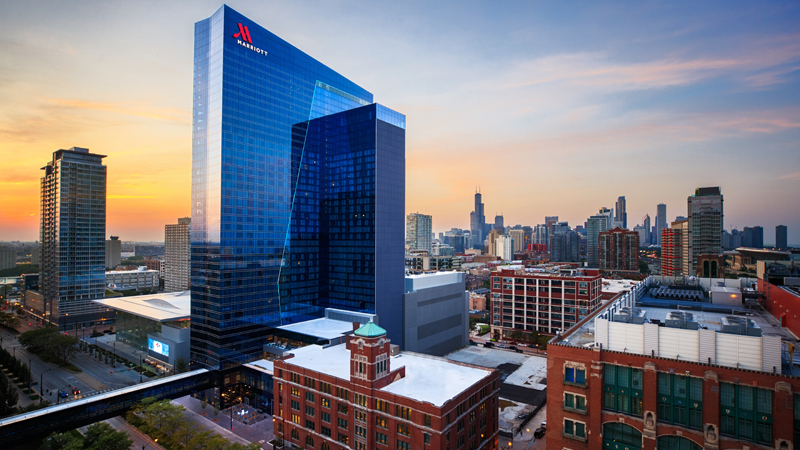 With both of Chicago's major airports accessible through public transportation, the Marriott Marquis' prime location makes it easy for meeting attendees across the globe to gather in one place. The hotel features the signature Marriott Great Room lobby with a Grab ‘n Go marketplace, perfect for breakfast or lunch, fitness center and business center. Views from the hotel's rooms will remind guests why Chicago is a city like no other. Ditch your usual travel experience and escape to the new Moxy Chicago Downtown. Located in the heart of the vibrant River North neighborhood, this hotel provides easy access to Millennium Park, diverse art galleries, exhilarating nightlife, gastronomical decadence and everything and anything on your Chicago bucket list. You and your technology can recharge in the contemporary rooms with plenty of USB and power outlets after an evening of unforgettable adventures in the city's designated playground zone. Their accommodations are bursting with desired amenities including motion sensor lighting, free blazing fast Wi-Fi and 49-inch Smart TVs to keep you well-connected to social media. Crave a midnight or anytime snack? You are covered at Zombie Taco with a 24-hour walk-up counter. You'll be buzzing about the custom cocktails at Bar Moxy while meeting up with friends in this space brimming with positive vibes. From spontaneous getaways to well-planned excursions, get out and play on at Moxy Chicago Downtown. A prime location, business center and 10,000-square-foot spa and fitness center - with an indoor pool - attract Hotel guests to the Palmer House Hilton, which also charms with the classic French Baroque decor in its landmark lobby. Originally a Chicago business magnates gift to his wife, the historic Palmer House Hilton has operated continuously since 1873. Each of the 1,639 rooms is equipped with Hiltons Serenity bedding and high thread-count linens. Rooms feature work desks and mp3 alarm clocks. Take advantage of the wellness concierge and head to the three-level spa and fitness center for a customized workout or swim in the indoor pool or work hard in the on-site business center. Before heading to the hotel restaurant for some French and Italian fare, you can sip some bubbly in the atmospheric lounge. The hotel has a gift shop, beauty salon and concierge services. Self and valet parking are available for a fee. 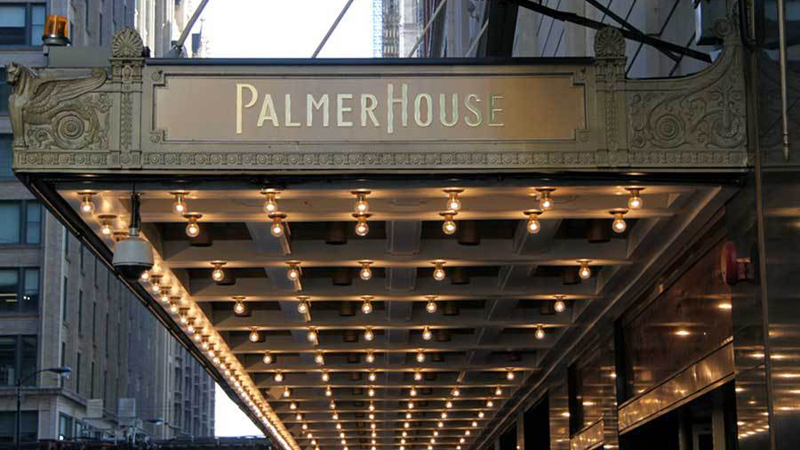 The Palmer House Hilton is on East Monroe Street in Chicago’s theater district. Two blocks east is Millennium Park, while the Magnificent Mile is a five-minute walk north. Take a five-minute cab ride to Chicago’s Navy Pier. Hotel guests thrill in the incredible architecture, excellent location and sleek, modern rooms at the well-maintained Palmer House Hilton, which is close to a lot of attractions and restaurants. Set in a neighborhood that’s home to dozens of art galleries, inspiration is a standard amenity at Hotel Palomar Chicago. Also nearby are world-class shopping along Michigan Avenue, outdoor fun on the Chicago River, and vibrant nightlife. The city’s famous dining is all around you, too, including the hotel’s own award-winning Sable Kitchen & Bar. Trying to stay healthy? There’s an indoor pool even the frostiest February can’t close down or try a rooftop fitness class. Amenities include indoor and outdoor pools, a fitness center, complimentary Wi-Fi and plush robes at the non-smoking Radisson Blu Aqua Hotel Chicago. The 81-story Radisson Blu Aqua Hotel opened in November 2011 with 334 non-smoking rooms graced with curved balconies. Each room features contemporary decor with aquamarine accents, free Wi-Fi access, flat-panel TVs and laptop-sized safes, high-end bath products and terry-cloth robes. The hotel has an 8,000-square-foot fitness center, which offers a sauna and steam room. Other on-site amenities include an 80,000-square-foot lifestyle garden, with its one-fifth-mile running track, outdoor lap and wading pools, hot tub, sundeck, fire pits, cabanas and dedicated yoga area. Once you’ve worked up an appetite, head to the on-site Italian restaurant. The hotel also includes a business center, game room and a concierge floor. Pets are welcome. Self-parking and valet parking are available for an additional fee. 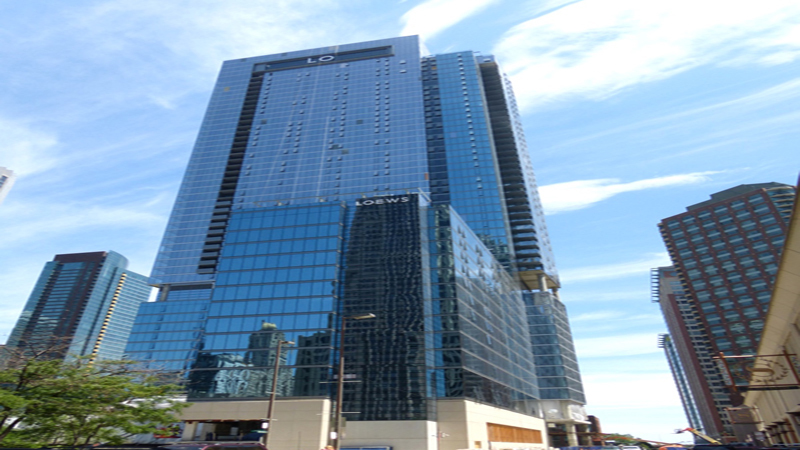 The Radisson Blu Aqua Chicago is between Michigan Avenue and Lake Michigan, along the Chicago River. Not only does this prime location make for spectacular views, but also easy access to downtown Chicago’s top attractions. Step outside the hotel doors and walk straight up the Magnificent Mile to Water Tower Place. Navy Pier is one mile away. Millennium Park, a popular destination for tourists and locals, is a five-minute walk. The Field Museum, Shedd Aquarium and Adler Planetarium are less than three miles away on Museum Campus. Willis Tower is two miles to the west. Sports fans can catch a cab and ride 15 minutes to Wrigley Field. 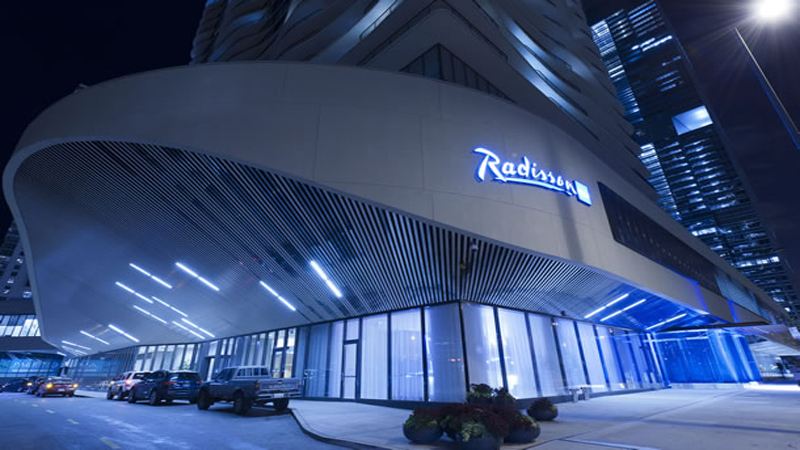 Hotel guests rave about the amazing design and friendly and accommodating staff at the Radisson Blu Aqua Chicago, calling it a must for the fitness-oriented business traveler. Merging the business of the Loop with the pleasure of State Street and Chicago’s Theater District, the newly renovated Renaissance Chicago Downtown Hotel invites discovery at every turn. Winner of a TripAdvisor Certificate of Excellence, the Renaissance Chicago enthralls from the moment you enter the lobby – featuring a VIP R Lounge, Artist Studio, Coffee Bar and Library. Unwind and revitalize in one of the 520 guestrooms and 40 suites featuring unique amenities with marble accents complemented by skyline views of the city’s famed architecture. Wind down inside this boutique Chicago hotel Rejuvenation Center boasting a refreshing indoor pool and indulgent spa services. Experience a unique and hip scene with local flair, delectable dishes and creative cocktails. One of the leading Chicago Loop hotels is just steps away from upscale shopping, fine dining, the theater district, and Millennium Park. Your own Windy City experience awaits at this downtown Chicago luxury hotel. 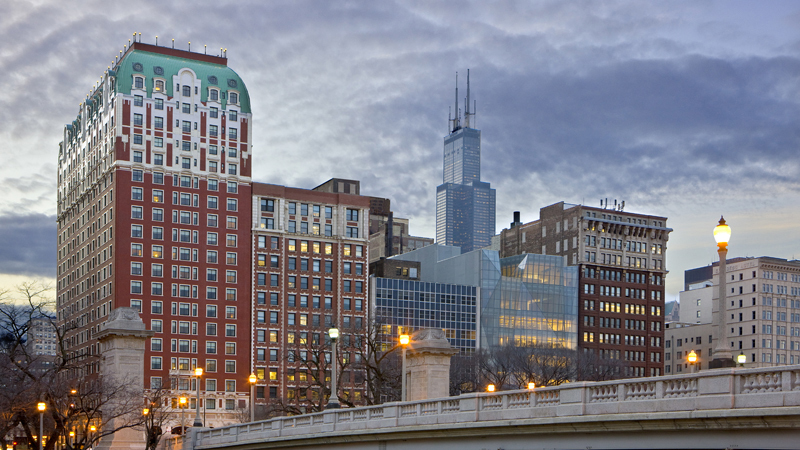 Immerse yourself in the culture of the Windy City from Residence Inn Chicago Downtown/River North. Ideal for extended stays. Spread out and relax on comfortable beds with crisp linens, thick mattresses, custom comforters and fluffy pillows. Upgrade your stay to one of the City View Suites to create a romantic setting for your weekend getaway. Jump start your day in Chicago with a free hot breakfast, offering hearty eggs, savory strips of bacon and fresh fruit. For an evening of signature cocktails, flavorful wines and delicious finger food, head down to the lobby and visit Holloway's Bar. Stay active with the cardio equipment, free weights and city view in the 24-hour fitness center before cooling off with a dip into the refreshing indoor pool or soothing whirlpool. NEWLY-RENOVATED! Standing 27 stories tall in the heart of Chicago’s thriving River North neighborhood, this newly-renovated hotel is surrounded by top-rated attractions and offers the trusted Marriott experience but with a new twist. They are proud to announce their new onsite bar, Holloways, which is located off The lobby and overlooks the bustling city. Enjoy craft cocktails and a small plates menu sitting in one of the many tech-enabled furniture pieces or near the cozy fireplace. They are rated as one of the top hotels in downtown Chicago for their location just blocks away from the Magnificent Mile, the Theater District, Northwestern Hospital; and nearby Millennium Park & Navy Pier. The refreshed suites offer free WiFi, separate living spaces, convenient kitchenettes with mini-refrigerators and microwaves and, of course, stunning city views. Start the day at our free breakfast buffet, get a nightcap at the brand-new bar, or head to the top floor to use the popular indoor pool. This 42-story property has 661 rooms with comfy beds, oversize work desks, 37-inch, LCD HDTVs, iHome stereos and iPod docking stations. The hotel also has a full-service business center, a steakhouse and a lounge on-site. 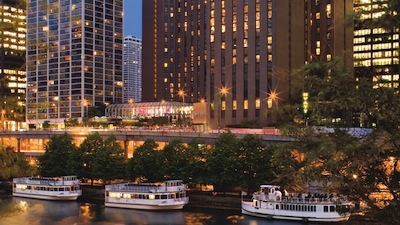 The Swissotel is located on the river in downtown Chicago. Navy Pier and Millennium Park are both less than one mile away, and the Field Museum and Soldier Field are both two miles to the south. 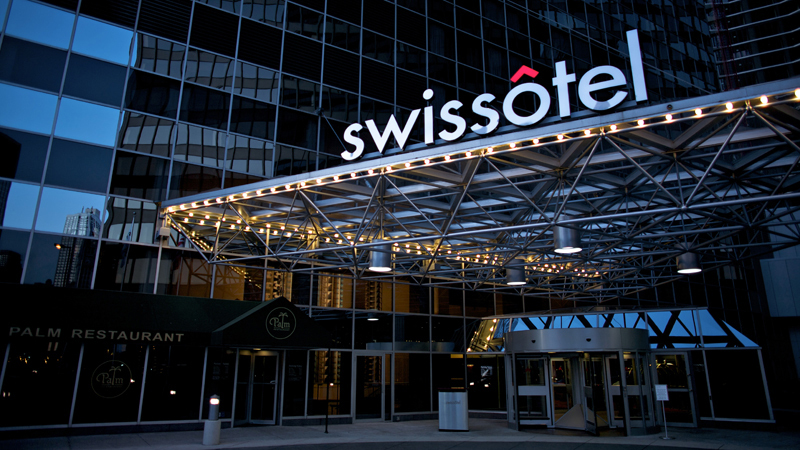 Hotel guests applaud the great location, delicious breakfast buffet, spectacular views and comfy beds at the Swissotel Chicago. 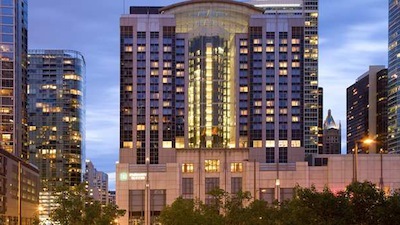 Discover Chicago, IL from one of the finest historic downtown Chicago hotels, the Renaissance Blackstone, conveniently located next to Grant Park and the downtown Chicago Loop. The Blackstone offers luxury accommodations & is the perfect place to embark on your explorations of the Magnificent Mile. Follow the footsteps of Katherine Hepburn, Al Capone and numerous US Presidents that have been swayed by the illustrious allure of the Blackstone since 1910. This marvelous Chicago hotel near Grant Park is housed in an elegantly restored French Beaux-Arts structure, giving an air of grandeur to each of its 332 lavish hotel rooms and suites. The historic The famed Chicago Art Institute is just 3 blocks from their front doors. The Field Museum, McCormick Place, Millennium Park, Navy Pier, Soldier Field, & the United Center are mere minutes away. Savor the exquisite beauty and majesty of one of the top Chicago hotels. The Gwen is 45 minutes from O'Hare International Airport and 30 minutes from Midway Airport. It's in the center of excitement on the Magnificent Mile, adjacent to Nordstrom and The Shops at North Bridge. It is also steps from Water Tower Place, American Girl Place and other stylish boutiques and eateries. The John Hancock Building is a 10-minute walk away. The Gwen has 300 non-smoking rooms on 16 floors, each furnished with contemporary decor in warm colors and rich fabrics, including custom-quilted headboards and luxurious touches such as pillowtop mattresses, pillow menus and ergonomic leather chairs with ottomans. They also feature spacious baths with marble vanities, soaking tubs and separate showers. Guests enjoy 42-inch flat-panel TVs, Bose sound systems and alarm clocks with iPod docking stations, as well as safes and free Wi-Fi. On-site amenities include a concierge, a gift shop, a convenience store, an ATM, a business center and a 24-hour fitness facility. All the comforts of home are yours to enjoy at The Westin Chicago River North. The experienced, multilingual staff is always on hand to make sure you have everything you need to feel your best. Same-day laundry service, dry cleaning, and in-room dining are all available at the touch of the Service Express button. After you’ve taken advantage of their express checkout service, let their bellhops transport and store your luggage while you browse the gift shop or explore the neighborhood one last time. Whatever you need to make your stay more pleasant, their team will see that you have it. An exceptional downtown Chicago location, luxe rooms with high-end amenities and Wi-Fi, plus a private massage therapy suite keep Hotel guests returning to the Wyndham Grand Chicago Riverfront. The Wyndham Grand Chicago Riverfronts 39 floors house 356 spacious rooms sporting chic, modern decor and wonderful views of downtown or the Chicago River. In-room desks are complimented by ergonomic chairs, while separate seating areas offer chaise lounges and overstuffed chairs. Given the Wi-Fi, flat-panel TVs, oversize baths with designer toiletries and room service, guests can have a relaxing evening in their rooms. Throw in the private massage therapy suite, 24-hour fitness studio, business center and American restaurant, and there’s plenty to recommend this property. 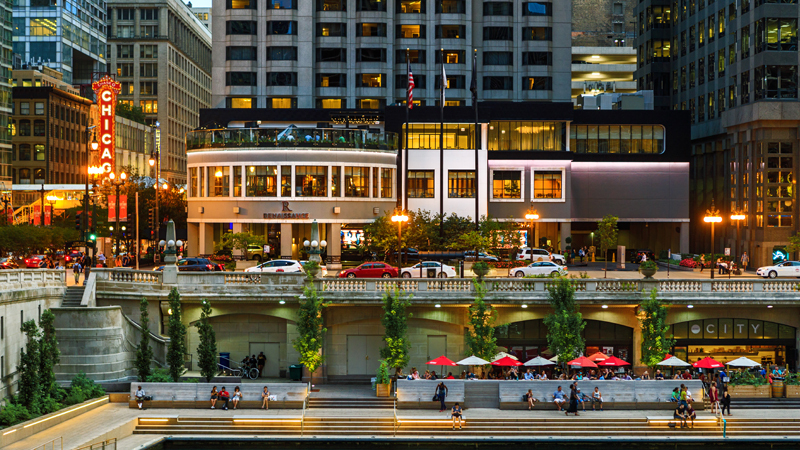 Overlooking the Chicago River at the intersection of Wacker Drive and Michigan Avenue, the Wyndham Grand Chicago Riverfront is located by upscale shopping and dining along the famed Magnificent Mile one block away. It’s a short walk to destinations such as Navy Pier or the beaches along Lake Michigan. Attractions less than one mile away include The Art Institute of Chicago, Hancock Observatory and Millennium Park. Adler Planetarium and Wrigley Field are within five miles of the property. 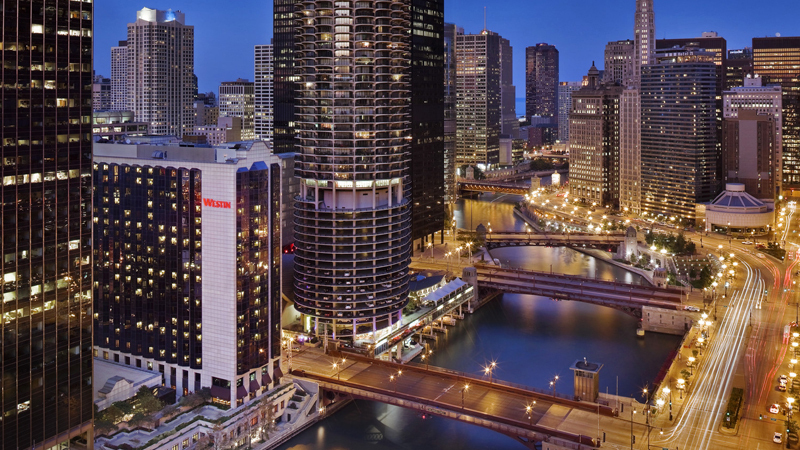 With a location anyone would want to call home, plus plenty of well-thought-out amenities, the luxurious Wyndham Grand Chicago Riverfront earns high marks from Hotel guests headed to the Windy City.